Pinks, Yellows, Prints, Fancy Pants, The Clutch, Silver Shoes, Dramatic Earrings, Tribal, and Sporty Details. 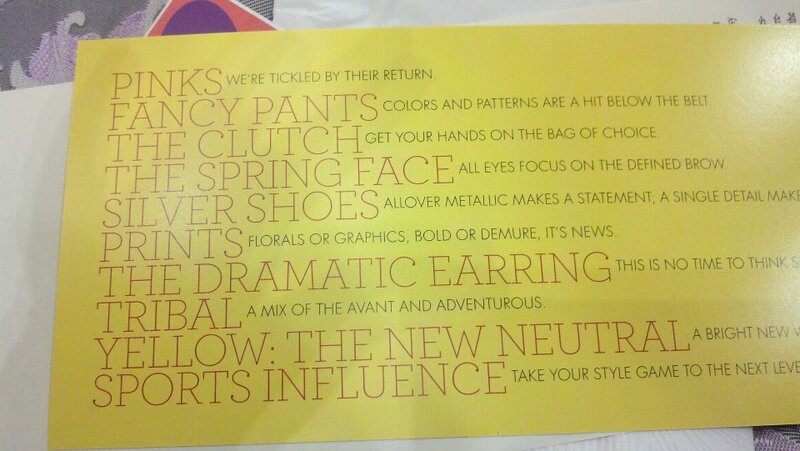 FGI members got this reference card at the Spring Trend Event hosted by Nieman Marcus on Feb 23, 2012. Translating the trends from runway looks to real life can be tricky. Runway fashion is designed to look dramatic and exciting on tiny models (as young as 14!). These looks don’t translate directly to curvy adult women living in the real world. Shoes or bags to take attention away from the whole body. If you have a tummy, choose styles that give you a little extra room in your waist but still lay close to your body. The key is to get a slim fit without any pulling or gapping. Make these bright colors look modern by paired them with gray, white, tan and metallic. To make them more formal or traditional, pair them with black or navy. Here’s a collage with some ideas for how to wear these pops of color for three figure types – full bust, full hips, and full tummy. For more spring trend news, click here for Ken Downing’s summary of New York’s Spring 2012 Fashion Week. How do you wear the trend? What works for your body type? I’d love to know! Post your pics in the comments or on Facebook.